Ethyl ascorbic acid is a molecule produced by modifying ascorbic acid, commonly known as vitamin C. This modification is done to increase the molecule’s stability and enhance its transport through skin, as pure vitamin C is easily degraded. In the body, the modifying group is removed and vitamin C is restored in its natural form. Thus, ethylascorbic acid retains the benefits of vitamin C, such as antioxidant activity. Furthermore, it is even more potent in reducing skin darkening after UV exposure. It even has some additional effects, not observed in pure ascorbic acid, such as promoting nerve cell growth or reducing chemotherapy damage. Finally, the slower release also ensures that no toxic effects are observed when using this vitamin C derivative. 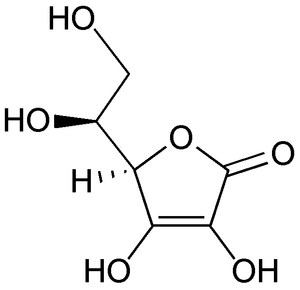 3-O-ethyl-L-ascorbic acid, or ethyl ascorbic acid, is a molecule produced by modifying vitamin C (ascorbic acid). The benefits of vitamin C for skin are extensively researched and known: it is required for synthesis of collagen, protects the cells from oxidation due to ageing or other causes, and reduces the damage from UV exposure . However, including pure ascorbic acid in cosmetical products is complicated. This molecule is relatively unstable – on exposure to light, it is oxidized, changes color to yellow, and its antioxidative capabilities are reduced . Furthermore, the absorption of pure vitamin C through skin is relatively poor. It is best absorbed at pH below 3.5, which is much lower than skin pH and rather unsuitable for cosmetical applications . Therefore, several vitamin C derivatives, among them ethylascorbic acid, have been developed to address these shortcomings. These derivatives are digested after being transported through skin and ascorbic acid is released, therefore, the positive benefits of vitamin C are retained . Even more, such derivatives produce a timed release of the vitamin, instead of delivering a single high dose, so the adverse effects of possible vitamin overdose are avoided . In fact, ethylascorbic acid had the lowest toxic compared to vitamin C and several common derivatives, remaining beneficial even after 10-fold overdose . These tendencies suggest that ethyl ascorbic acid should be able to act as an antioxidant. In fact, its activity has been proven in reducing the oxidation of lipids. Lipids are water-insoluble molecules, such as fats or cell membrane components, and they can be readily damaged by oxidation or peroxidation. Ethylascorbic acid was shown to reduce this process by up to 93 % . Furthermore, like vitamin C, ethylascorbic acid exhibits a protective effect against UV radiation. It inhibits melanin synthesis, occurring after UV exposure, and thus prevents darkening of the skin . Due to this property, it is used in several cosmetics products as a skin whitener or sunscreen ingredient , . Almost two-fold decrease in melanocytes is observed using this ingredient at concentrations as low as 0.01-0.02 %. This effect also exceeds that of other vitamin C derivatives, or even pure ascorbic acid . Interestingly, in addition to the vitamin C release, ethyl ascorbic acid may have further benefits of its own. In a study performed with nerve cells, this molecule stimulated outgrowth of new neurites (nerve cell structures that allow communication with other cells) . Since most of the ethylascorbic acid remained undigested, it is believed that vitamin C release is not related to the observed benefits. It is even suggested that ethylascorbic acid is beneficial for cancer patients, as it increases the effectiveness of chemotherapy and reduces damage to healthy cells . P. S. Telang, “Vitamin C in dermatology,” Indian Dermatol. Online J., vol. 4, no. 2, pp. 143–146, 2013. S. R. Pinnell, H. Yang, M. Omar, N. Monteiro-Riviere, H. V. DeBuys, L. C. Walker, Y. Wang, and M. Levine, “Topical L-ascorbic acid: percutaneous absorption studies,” Dermatol. Surg. Off. Publ. Am. Soc. Dermatol. Surg. Al, vol. 27, no. 2, pp. 137–142, Feb. 2001. Y. Nihro, S. Sogawa, T. Sudo, T. Miki, H. Matsumoto, and T. Satoh, “3-O-alkylascorbic acids as free radical quenchers. II. Inhibitory effects on some lipid peroxidation models,” Chem. Pharm. Bull. (Tokyo), vol. 39, no. 7, pp. 1731–1735, Jul. 1991. K. Maeda, Inoue, Y., Nishikawa, H., Miki, S., Urushibata, O., Miki, T., and Hatao, M., “Involvement of melanin monomers in the skin persistent UVA-pigmentation and effectiveness of vitamin C ethyl on UVA-pigmentation,” Nippon Koshohin Kagakkaishi, vol. 27, no. 4, pp. 257–268, 2003. Yasunori, Niino and Hiroshi, Tanaka, “Cosmetic,” 11-199425. Toshie, Hakano and Takashi, Iida, “External composition for skin containing 3-O-ethylascorbic acid,” 2014-009172. A. Tai, M. Aburada, and H. Ito, “A simple efficient synthesis and biological evaluation of 3-O-ethylascorbic acid,” Biosci. Biotechnol. Biochem., vol. 78, no. 12, pp. 1984–1987, 2014. M. Futakuchi, M. Hirose, T. Miki, H. Tanaka, M. Ozaki, and T. Shirai, “Inhibition of DMBA-initiated rat mammary tumour development by 1-O-hexyl-2,3,5-trimethylhydroquinone, phenylethyl isothiocyanate, and novel synthetic ascorbic acid derivatives,” Eur. J. Cancer Prev. Off. J. Eur. Cancer Prev. Organ. ECP, vol. 7, no. 2, pp. 153–159, Apr. 1998.